The catch-all address is the default email address to which all emails, addressed to a non-existent or incorrectly typed email account of your domain name are routed to. For example, if someone sends an email to test@yourdomain.com which does not exist, the catch-all option will forward this email to an email address of your choice. Login to the cPanel account for the domain. Click on Default Address icon under Mail in the cPanel home screen. From the dropdown menu, select the domain or sub-domain you wish to set up a default address. o Discard the mail with a failure message. o Forward mail to an email address of your choice. 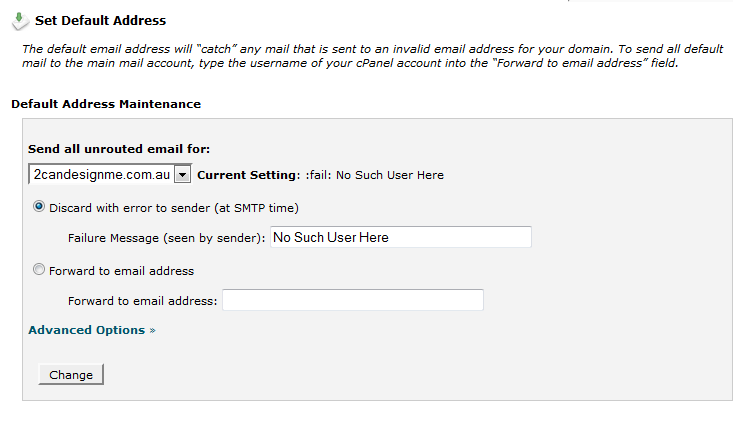 Note: If you enable catch-all email address, this increases possibility of receiving of SPAM emails.